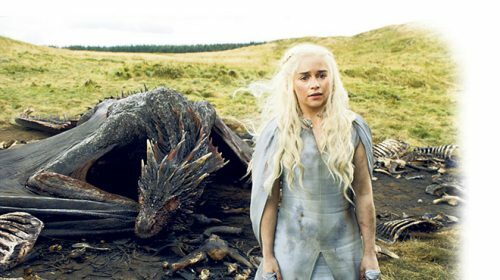 Game of Thrones is set to bid farewell to Northern Ireland, its main filming location since 2010 and after eight seasons at Titanic Studios in Belfast. Cast members of the HBO smash hit have been filming their final scenes of the final series and are expected to wrap before the end of this summer and broadcast next year. It has been a huge boon to both Northern Ireland’s tourism and film and TV industries. Fans from around the world travelled to The Dark Hedges in Antrim, used as the King’s Road, and and to Tollymore Forest Park which served as the Haunted Forest from which the White Walkers marched into the realm of men. Castle Ward and its lands, in Co Down, was home to the fictional House of Stark. Last July a 250ft Bayeux–style tapestry, recapping the first six series of the show, went on display at the Ulster Museum in Belfast. The tapestry was hand-woven and hand-embroidered using cloth from one of Northern Ireland’s last linen mills, Thomas Ferguson’s in Banbridge and was created as part of a partnership between Tourism Ireland and HBO. Emilia Clarke, the English actress who plays ‘Daenerys Stormborn of the House Targaryen, First of Her Name, the Unburnt, Queen of the Andals and the First Men, Khaleesi of the Great Grass Sea, Breaker of Chains, and Mother of Dragons’ posted a farewell on Instagram after filming her final scenes. Cast members Kit Harrington, who plays Jon Snow, married Rose Leslie, who starred as Ygritte in the second series and now stars in US television’s legal and political thriller The Good Fight, married in a Scottish castle last weekend.